U.S. Army SHARP Director Monique Ferrell honors women veterans Saturday in her keynote address. Along with celebrating the territory’s veterans Saturday, speakers at an afternoon program on St. Thomas paid tribute to the “women warriors,” who they said have blazed trails not only on-island but around the world while defending the nation. Gov. Kenneth Mapp and members of the Charlotte Amalie High School Class of 1983 honor Saturday’s Parade Grand Marshal Laurel Francis, seen standing to the left of Mapp. According to Ferrell, the territory is home to 550 female veterans, including Saturday’s Veteran’s Day Parade Grand Marshal, Sgt. 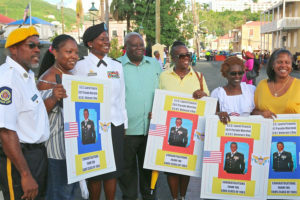 First Class Laurell Francis, Adjutant General Deborah Howell (the first female adjutant general in the Virgin Islands,) V.I. Territorial Emergency Management Agency Head Mona Barnes and V.I. Elections Supervisor Caroline Fawkes, who Ferrell said was the first woman in the Armed Forces to pilot the SH-33 Sherpa aircraft. A civilian officer whose sons and husband are both veterans, Ferrell also paid tribute to those female family members – wives, daughters and sisters – who she said are just as committed to serving the country as their loved ones. Among the speakers Saturday were Gov. Kenneth Mapp and Delegate Stacy Plaskett, who added their appreciation for the territory’s service men and woman who continue to fight overseas. 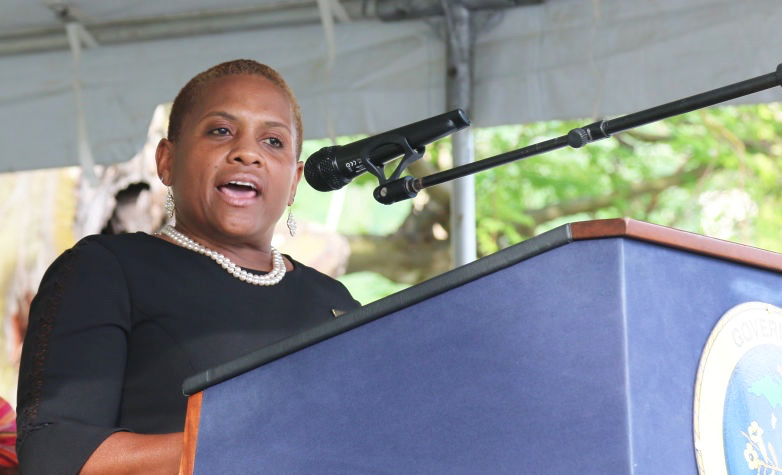 “The Virgin Islands has the highest personal sacrifice per capita in the conflicts of this nation, and we will continue to serve,” Mapp said. Ceremonies on St. Thomas started with the traditional Veteran’s Day parade, which began at the Western Cemetery and ended at the Franklin D. Roosevelt V.I. Veteran’s Memorial Park. Along with the veterans dressed in uniforms, medals and ribbons displayed, several battalions, young and old, marched down the hill from Main Street toward the park, and gathered around the bandstand near Fort Christian Parking Lot for the afternoon program.